Transforming population health through effective partnerships and innovation. We build evidence-based programs, provide fiscal support, and develop custom solutions to help you serve your community. Working together, we will continue to create innovative strategies to achieve positive health outcomes for all. Our aim is to empower health researchers and organizations across sectors to become the best at what they do—improving the health and well-being of their communities. Over the past 50 years, we have built a strong community of partners who work on the front lines to help more people live healthy and productive lives. Providing comprehensive contract and grant administration, human resources, accounting, operations, and fiscal sponsorship solutions. Offering end-to-end grant research and development, program design, delivery, and evaluation. Leading bold initiatives to advance total community health and drive systems change. Supporting your team with flexible services designed together–from capacity building to social marketing, strategic planning, and more. Heluna Health touches over 39 million individuals through our partnerships, addressing the full spectrum of population health needs. Largest Nonprofit WIC Program in U.S. Approximately one in five WIC (Women, Infants, and Children) program participants in the state of California is served by Heluna Health’s largest program—PHFE WIC. Our program is the largest nonprofit network of WIC centers in the nation. Heluna Health's services span numerous sectors within population health and are flexibly designed to help you address core challenges. 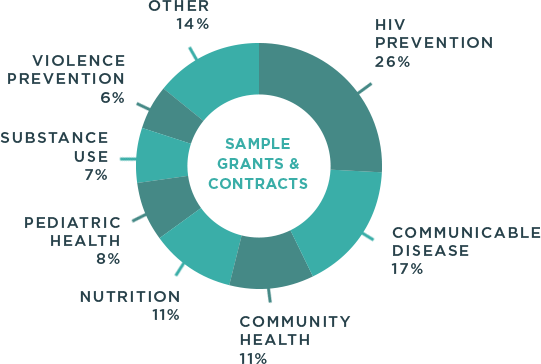 n= Scope of grants and contracts administered among a sample of 212 projects (2016, by %). Help us invent new possibilities in the field of population health. See our current job openings and learn more about life at Heluna Health.